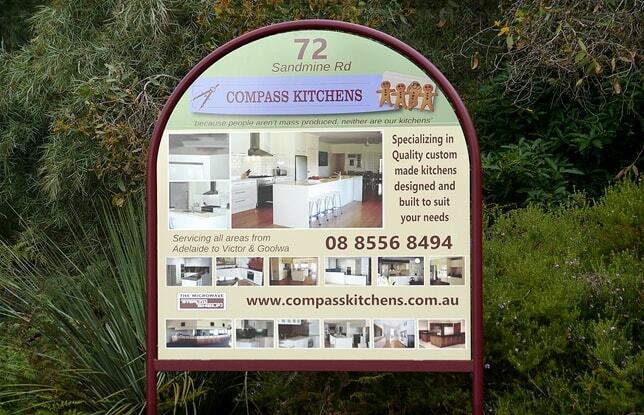 A Compass Kitchens Renovation at Willunga. 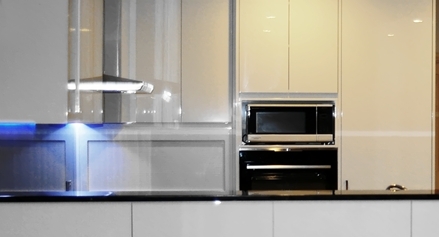 Working to our client's needs we designed this kitchen with function and form as the prerequisites. As an extra challenge we also needed to keep close to an original Tile footprint and having little more than a dozen spare matching tiles to replace those we needed for the new layout. This kitchen renovation for our client’s with its contemporary styling makes full use of the generous space and the high ceilings available in this room; whereby providing over 10 meters of deep bench space and lots of useful easy access storage, while incorporating full height doors and contemporary top shadow Moldings into the design. All 19 custom made wooden drawers that we built for this Kitchen have top quality Blum, Full-Extension, Soft-Close, Fully Concealed runners for effortless operation and maximized storage. 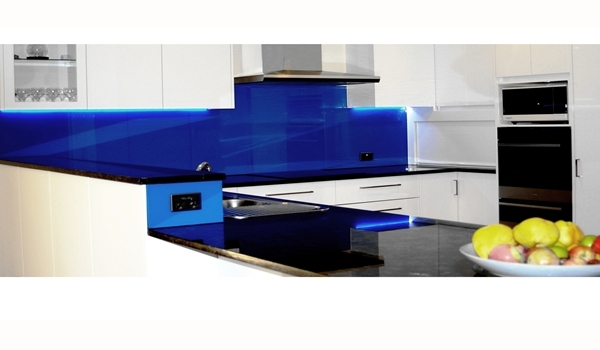 The stylish materials that our Clients selected included Polyurethane Two-Pack panels; which we buffed to a high Gloss & use of striking Peacock Pearl opalescent Granite Benchtops with pencil round edges that we then paired with Opti-Clear Toughened Glass Splashbacks; providing all the benefits of Beauty, Resilience and Easy-to-Care-for surfaces. 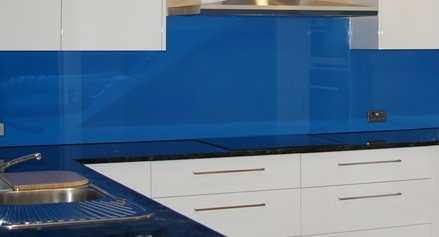 We incorporated a Tambour Roll-front Appliance Unit for your client’s frequently used accessories and incorporated a Miele Semi-Integrated Dishwasher into the design and created recessed door grips for all the overhead cabinets to achieve the clear lines our client’s desired to their overhead cabinetry. 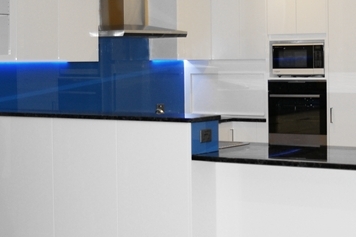 We used concealed LED accent Strip lighting behind the overheads to help illuminate the work tops; where these also really help bring out the deep Blue Opalescence within these Natural Peacock Pearl Granite Benchtops and that of the Dulux Splashback colour; Periwinkle. 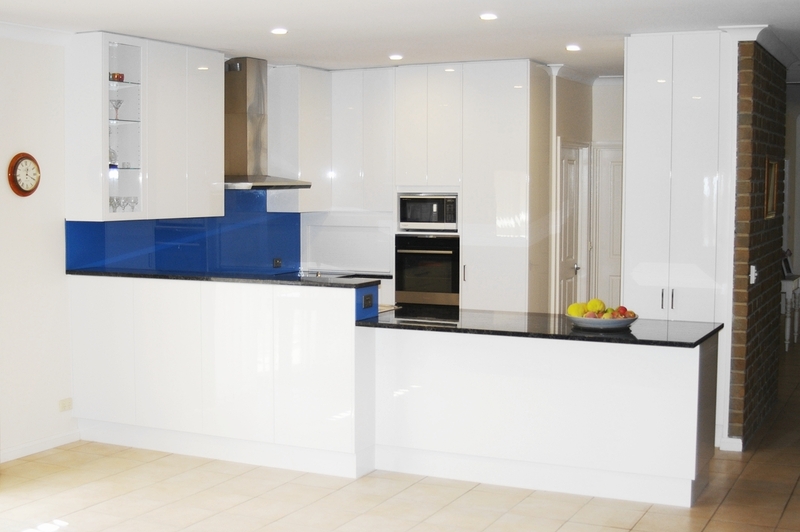 We made this Kitchen for clients at Willunga, South Australia using a high Gloss Two-Pack in a vivid Designer White colour. Our client’s requested an open alcove for them to fit their Microwave and their contemporary Robinhood Rangehood was ducted out to the atmosphere; helping to remove cooking odors as well as in it keeping this kitchen spotless. 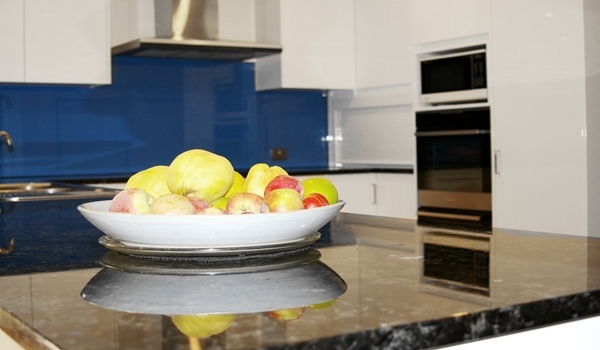 We have also incorporated extra storage in the Up-stand cabinets of the peninsula servicing the dining / family rooms. All-in-all this was another challenging and very satisfying commission; with us happily fulfilling all our client's brief.